Treat your little princess like royalty with this Princess Tiara Craft Kit. Each has a expandable coil band Perfect activity for the princess themed birthday parties or afternoon play date. Engage your little girl's creativity as they decorate their crowns and tiaras on their princess tiara and wear them imagining they're a beautiful princess. Royal fun for little girls of various ages! Or create a crown fit for royalty for your prince or princess guests. Kids can decorate with and assortment of glittery shapes, foam letters and shapes. Each foam crown is approximately 4 " high and has an adhesive tab closure and is adjustable to 24". Includes approx 250 shapes, geometric glitter stickers, foam shapes and letter stickers sized 1/2" - 1". 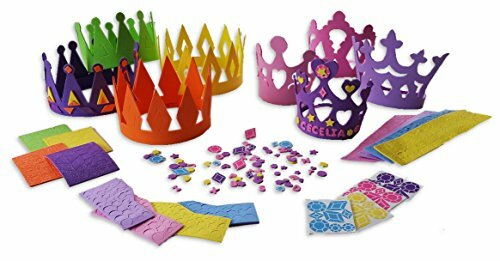 This set includes 4 Foam Tiaras and 4 Foam Crown craft kits that kids will decorate themselves. 4 Foam Crown Kits: Includes 4 colors and designs. Create a crown fit for royalty for your prince or princess guests. Kids can decorate with and assortment of glittery shapes, foam letters and shapes. Each foam crown is approximately 4 " high and has an adhesive tab closure and is adjustable to 24". Colors will vary. Includes approx 250 shapes, geometric glitter stickers, foam shapes and letter stickers sized 1/2" - 1". Colors will vary.